I'm excited about a number of games that'll be hitting store shelves between now and the end of the year, but none of them excite me more than New Super Mario Bros. Wii. The only thing that has kept that excitement in check: My experiences with New Super Mario Bros. on the DS. Don't get me wrong, it's an enjoyable enough game--but it's a cakewalk compared to earlier (two-dimensional) efforts centered around everyone's favorite mustachioed plumber. Thankfully, it seems New Super Mario Bros. Wii will be anything but a cakewalk. At least, that's the word from the crew over at MTV Multiplayer. "You've rocked the whole All-Stars collection, you mastered the Japanese Super Mario Bros. 2, you think you can handle just about everything," says MTV's Russ Frushtick. "Well New Super Mario Bros. Wii is going to teach you a lesson in humility. It's really hard." During a recent trip to Nintendo's New York City offices, Frushtick sampled some of the title's later levels. "The first they dropped me [into] was level 8-7 ... very near the end of the game. And it showed," he shares. "You remember those ghost house levels from Super Mario World where you had to stay on the moving platform as it slowly chugged past ghosts and other obstacles? OK, imagine that, but turn the platform into a slavering bone dragon and speed it up by about three times," Frushtick adds. "Oh, and throw on three other homicidal friends who would rather jump on your head than let you make a perfectly timed jump. "I went in expecting instant success," he says. "I left with zero lives and a lower sense of self worth." I am brand new to your blog and love it! This difficulty news is great to hear. 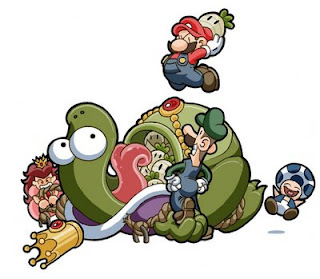 I am a Mario fanatic and I love hearing that I won't be able to just stroll up to Bowser's Castle and totally own him. BTW, I'm an cartoonist and I do some decent Mario fanart (if i do say so myself). I'd be thrilled if you ever wanted to use any of my art in your blog. If you're interested let me know and I'll get you my site to scope out my work.